The fact that the Prime Minister Vucic is involved in cooperating with the Clintons shows that he does not serve the interests of Serbian people. Unfortunately, most of the citizens do not realize the responsibility of their vote during elections. On the other hand, ordinary citizens are not really aware of the real situation in which our state finds itself. But the majority of Serbs will never forget all the evil and injustice that the United States has done to us with the support of other nations. Whatever the reason is that Prime Minister Vucic is so familiar with the Americans, there are some limits, he must have some dignity. Any cooperation with the Clintons, and this kind of soft policy with the USA, is considered outside of the interests of Serbian people. It seems like the classic American style of pressure and blackmailing. In the background there is the US attempt to control Serbia. This is their usual attempt to separate Serbia from Russia, reduce Russian influence, which is quite significant indeed. The fact that EU accepted a membership application from Bosnia and Herzegovina is also very disputable for Serbian people. The "great" western leaders are trying to destabilize and humiliate us in order to achieve their selfish plans. We see how they are proposing to all our neighbors - the former Yugoslavian republics - to join the European Union, but not Serbia. Obviously, they don't want us in their company. They want us to be their slaves. We want to be a part of the family, but we do not want to be humiliated and destroyed. Membership in EU is nevertheless not as good as it looks. Nobody knows what to expect for the future of Serbia. 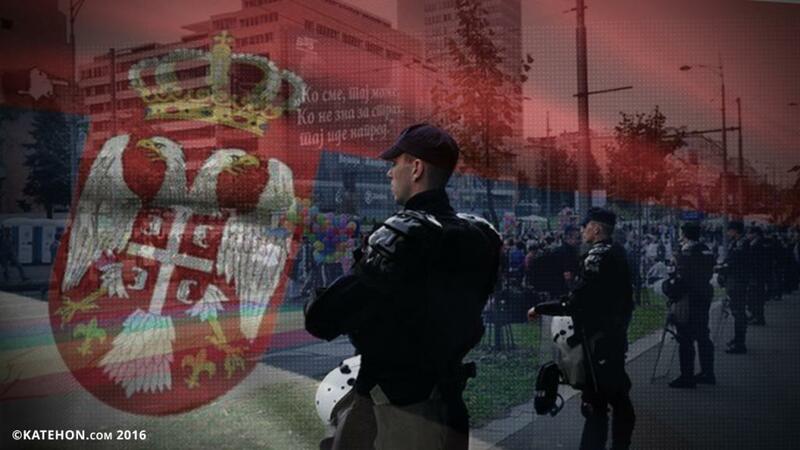 There is a gap between the Serbian government and Serbian people. It is a big problem, there is no mutual understanding and cooperation for our future. We are really at the intersection of the conflict with US and our interests. Another thing is that Americans are trying to do everything to spoil our good relations with Russia. There are some essential problems. Serbs are demoralized. In some way, it can be said that no one is really afraid of anything anymore. Whatever can happen will happen, and at any rate it is going to be bad for us. People are tired, there is no more strength to fight for our position. It is not known what to expect. Recently, there was a gay pride parade. This is the best picture of our conscience, what the attitude of Serbians is to the things we don't like. During this pride parade there was about thirty activists and three hundred journalists. The whole center of Belgrade was blocked and became a ghost town. Citizens do not have a tremendous concern about gay pride anymore, no one see any solution or any point of understanding. We can say that everyone is tired. There were no actions against the LGBT stunt. Some hooligans used the situation to fight with the police, but they definitely don't have a real concern about the encroaching normalization of homosexuality. Those hooligans were not inspired by the same feeling that the whole nation has about this issue. It is also possible that they might have been an instrument of some people from the government to make some simulation of activity. This year there was no one in the streets, ordinary people are very exhausted by the simple struggle of trying to get by. Nobody cares anymore about the walk of thirty lesbians and gays. Everyone just wanted that day to end. People stayed home, no one came to the streets by their own will, and that shows the social attitude at this juncture. They didn't want to give provocateurs that satisfaction of feeling important. We don't know what to expect from the so-called Republic of Kosovo. We don't know what the EU wants from us. Our government is getting close to Washington. So, people are really confused and just waiting. Our history shows that any time, when Serbs are at the edge, some bad things happen.